A few days ago, Lisa and I returned from an all too short vacation in France. We started up north in Puligny Montrachet then worked our way south to the golden sunshine of my family’s beloved Provence. When we arrived at our home in Cagnes sur Mer, near Nice (France), I only wanted to drink roses, pastis and red Bandols and eat Provencal food. The idea was solidified after I returned from the local farmer’s market armed with a beautiful wild sea bass caught that very morning and a basket of perfectly ripe figs…. It seemed like only yesterday that the ink was drying on my last post and I had to start the next one. This project may very well end up killing me. I am a slow writer with a busy schedule and a small child. Anyone who does not have a child will never fully understand what the word “busy” actually means. I laugh out loud when younger, single friends tell me how busy they are with all the bars they have to go to and tv shows they need to watch. Try weaving in the curve balls parenthood throws you from time to time. Portland’s week long ice storm ended as abruptly as it started and spring emerged victorious. With the demise of winter, so ended the season of heavy eating punctuated by the artery clogging big guns of French cooking and all the holiday classics. It’s fortunate because my belt did not have a wider notch to go to. My next move would have been similar to Homer Simpsons when he bought a mumu and decided to embrace obesity. My palate was looking forward to spring and a rebirth of lightness punctuated with bright, colorful splashes of flavor. an emotionally unstable pint sized dictator with the uncanny ability to know exactly how far to push you to utter insanity before reverting to a lovable cuddle-monster. I nervously laughed when I read those words aloud. Actually I wanted to cry, but people were standing near and I felt I had to keep my appearances up. This definition of toddler completely encapsulates what life with a four year old means in our household. One day varies so greatly from the next, leaving Lisa and I to wonder which son we will have each morning. Two Eggs, side by each, both facing the Sun! There comes a time in all our lives where we need to come to grips and embrace who we are and what we’ve become. Some are forged out of experiencing life changing traumatic events while others reluctantly accept the path they were born into. A bird is a bird and eventually it must fly, to deny the bird flight is is to deny it’s very existence. After 50 years of life on this planet I finally am coming to grips with whom I was born…. Today while power walking through the Desert I started contemplating my life and where I want it to go with it. I always found the solitude of walking with only the Desert winds answering me to be my way of connecting to (insert your favorite deity)… for lack of a better word, GOD. I focus my thoughts on my positive goals and aspirations, goals like being a better husband to Lisa, being a better father to Beaumont, being a better Chef professionally, being a better friend, being a better citizen on Earth. We must challenge and push ourselves to the extremes to be the greatest. 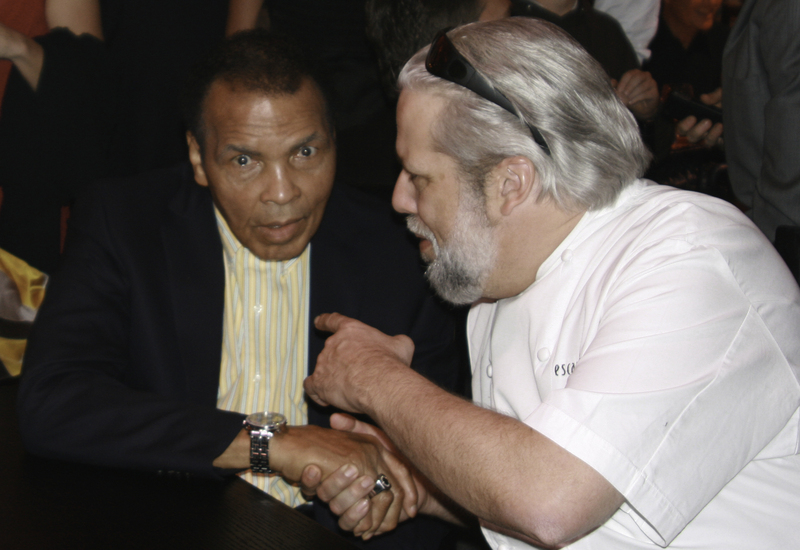 One year ago I had the great fortune of being one of five Chefs cooking for Muhammad Ali on his 70th Birthday. I first met Ali when I was a small child. I grew up in his neighborhood on the south side of Chicago. The man was a force to be reckoned with. 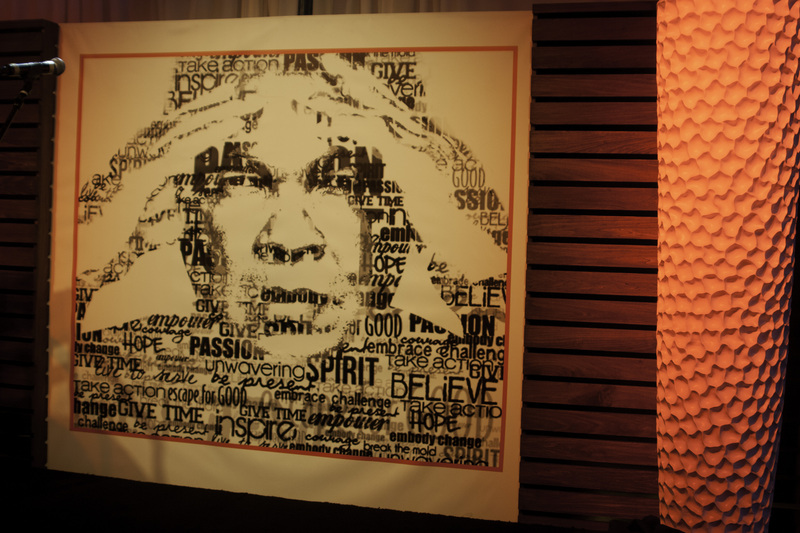 I look at the picture above and it is filled with words and phrases like: inspire, break the mold, spirit, believe, hope, embrace, give time, unwavering, passion, take action, give. Words we all should meditate on and incorporate into our lives. Words I should live my life by.